We pull into the school's parking lot, which appears to be a lot fuller than normal. As Kaden opens the door to the car, he turns to me and says, "Oh yeah...we have Open House today." I pause. Look down at my ensemble and begin to ask a dozen questions. "Will I have time to get ready?" "Why didn't you remind me?" Kaden answers each question without hesitation. "The paper is at home. I saw it on the desk." "I think it starts at 10." "You signed my folder with the reminder in it." Good job, mom! Way to forget...again. I hurried back home, found something to wear, and rushed right back to the school. There was a slew of parents trickling into the school's lobby. We were greeted by the principal, who directed us to our child's location. Kaden was in strings practice. 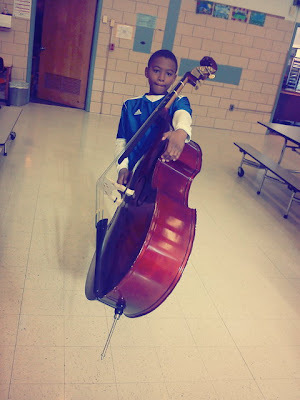 Once strings ended, we walked to his classroom. The students were completing Thanksgiving activities. 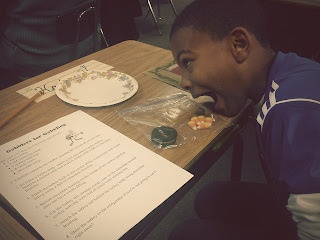 Then, the teacher told us there was a fun craft to complete. 1. Gently separate one Oreo cookie, leaving one side with the white cream on it and the other without any. Spread chocolate frosting on the side with the white frosting. Completely cover it. 2. Take a malted milk ball and red cinnamon candy and connect them with a dab of chocolate frosting. 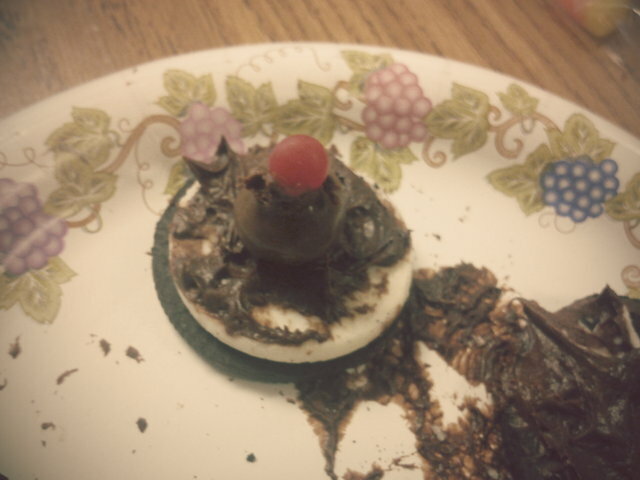 Place the malted ball on top of the Oreo covered with white cream and frosting, close to the edge (see pic). 3. 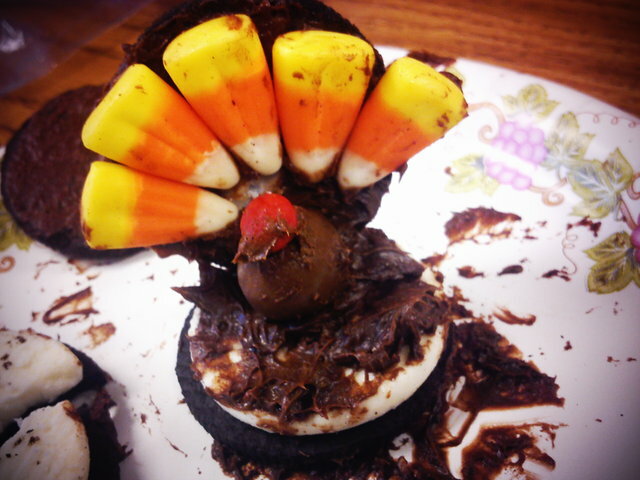 Take the Oreo cookie, without the white cream, and spread chocolate frosting over it. 4. 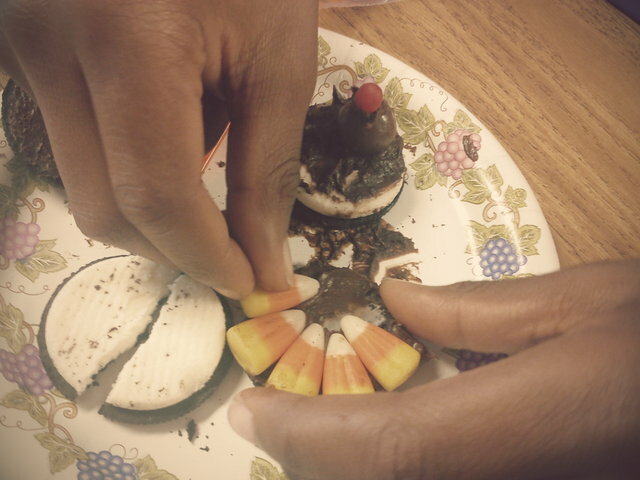 Arrange the candy corn around the cookie with the widest point against the edge, and the point facing inward. 5. Take the piece from step #4 and press it behind the malted milk ball, standing up behind it. 6. Remember to have fun. 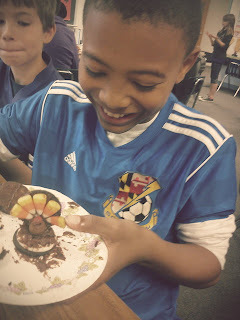 The students had a blast making the craft AND getting to lick the chocolate frosting off of their hands. Try this fun, edible treat with your children. They make cute decorations for the table at Thanksgiving.